Hello! 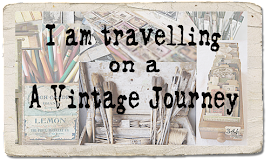 Nikki here from Addicted to Art for our first stop on our February Destination Inspiration journey. For this months adventure I must use the following! Quite a comfortable set for me - I have really struggled with the last couple of these posts I have done but this one was right up my street! The first couple of photos here show 2 tags - as my original plan was to layer two together but this all changed as it often does. 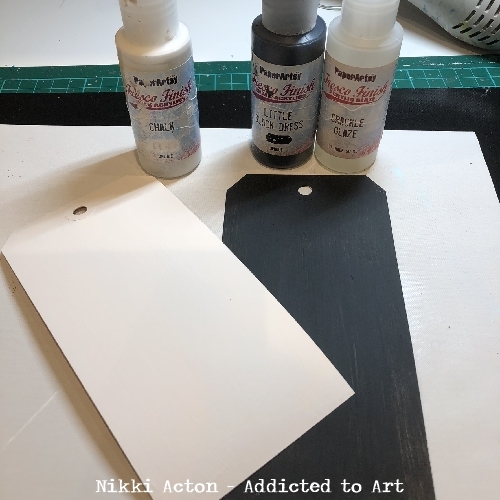 So first I painted my tag black (PaperArtsy Little Black Dress) before adding PaperArtsy Crackle glaze and left it to dry. 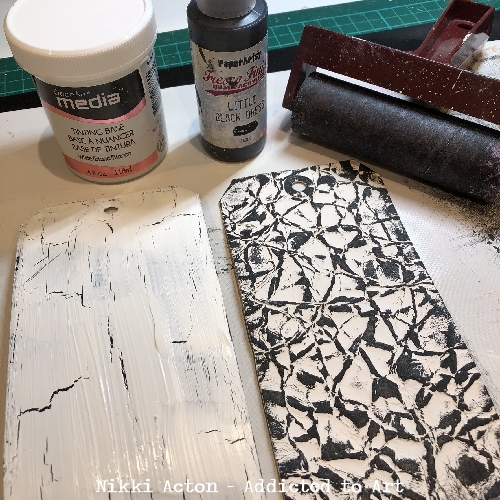 Once dry I added Deco Art Crackle paint... you can see the cracks developing below (left hand tag). 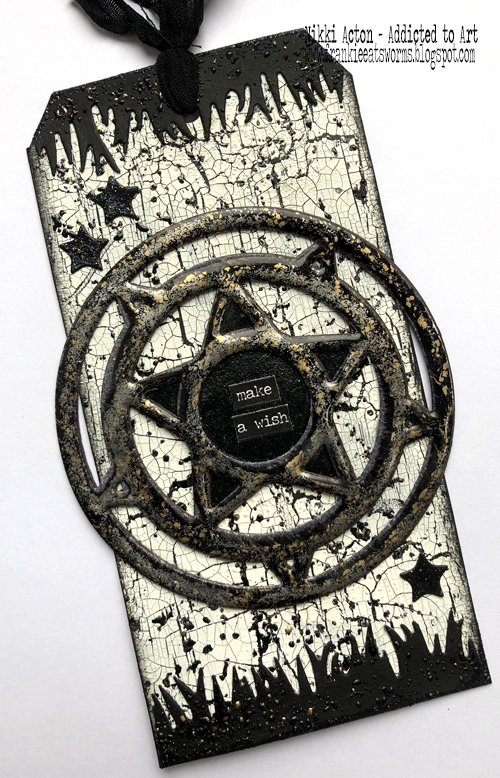 I die cut Spellbinders (Seth Apter) Stardust die and painted black before embossing with Stampendous Frantage embossing enamel in Aged Black. 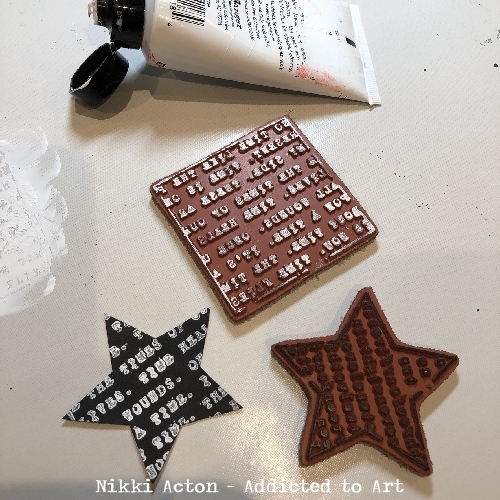 I decided to add a solid star under my die cut and so stamped one of Seth's star stamps from PaperArtsy (same size - yay!) and cut it out. Yes it was going to have text on originally - but in the end I just painted it black. 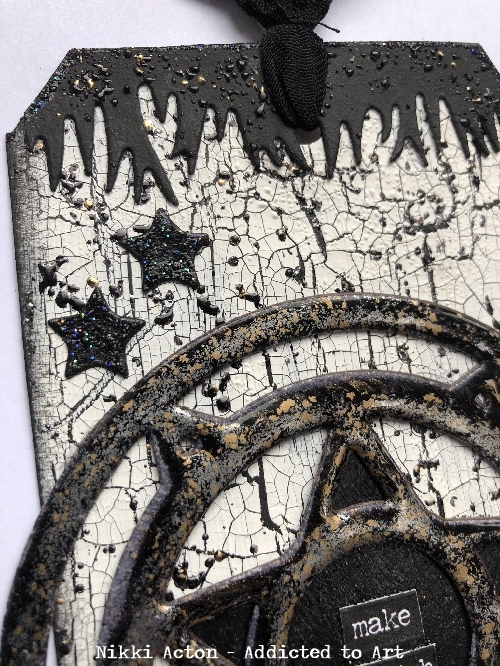 To complete the tag I added some punched stars and added a little sparkle to them and the borders with crystal glitter glue. Last Friday we started a new challenge - 'Melt It'. If you missed all the inspiration do head over to check it out, we would love to see your creations. Stunning double crackle and the embossed die-cuts look fabulous against it. A brilliant tag! Love the crackle! great tag. 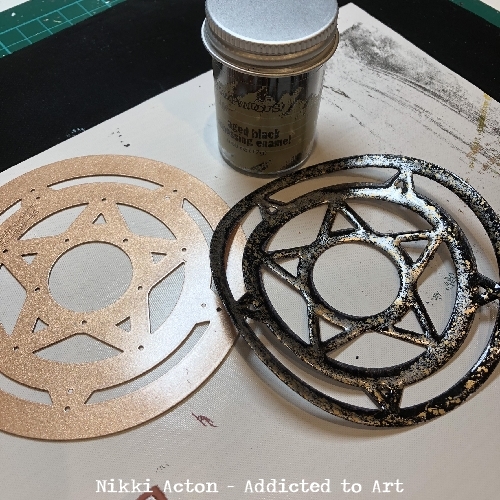 Oh wow indeed, Nikki- all of your DI projects have always been great but this one really rocks it, - it's obvious this was right up your street! Amazing double crackle and the diecut looks like metal the way yo have treated it. Superb tag!!! WoW! 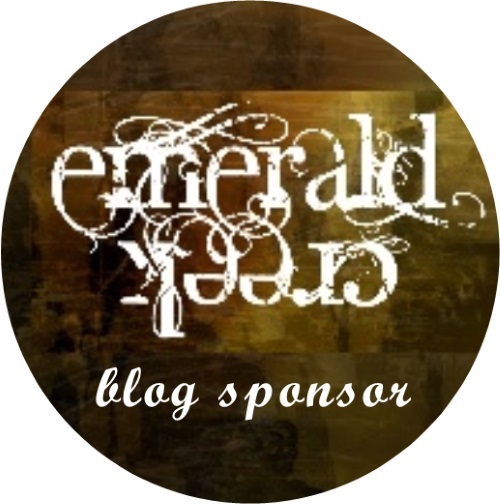 You have picked that travel bag of goodies and created an absolutely Stunning tag, NIkki ( and that's Stunning with a capital 'S'). 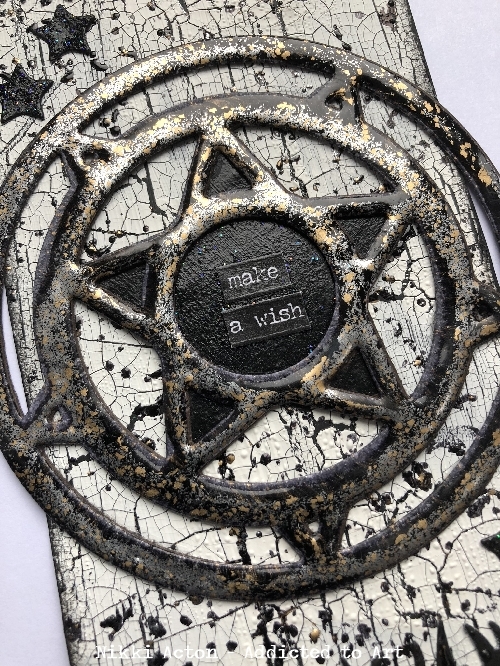 For me this has to be one of THE most striking tags I have ever seen - monochrome, crackle, grungy embossing and the perfect choice of die in your capable talented hands = Artistic magic . Yes! This is amazing in black and crackle! And That die cut is finished to perfection in Aged Black Frantage (a powder I don't believe I have in my drawers!) 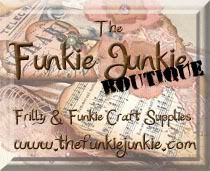 Exceedingly well done and great use of those crafty goodies! Hugs! Get out of town Nikki Acton. This is spectacularicious. 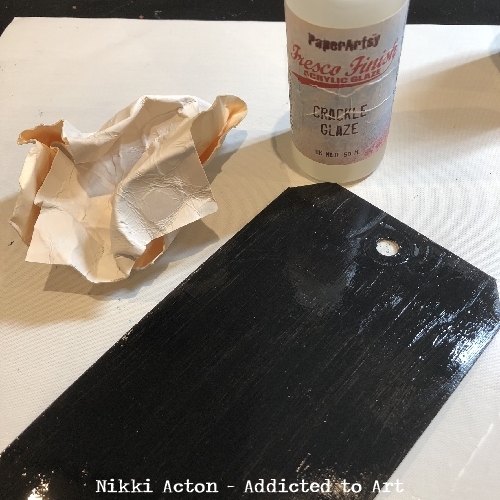 Very cool tag Nikki! Love that black with that EP!! Very Smart! Oh Nikki - this is just so AWESOME. Love the monocromatic look and all the texture. Wow. FABULOUS! Xj.